Around 1850, John Gorrie, an innovative Florida physician, created an ice-making machine that he thought could be used to regulate the temperature of buildings – and even maybe entire cities. Unfortunately, he was unable to secure the financial backing needed to get the enterprise off the ground. Today, financing is available for Weld County HVAC customers and Larimer County HVAC customers looking to invest in a new heating or air-conditioning system. Evans Air Experts is much more than just a furnace repair company in Greeley, Colorado. Our NATE-certified technicians can repair any make or model furnace, but if it can’t be fixed, we’ll install a new furnace that meets your family’s needs without breaking your budget. 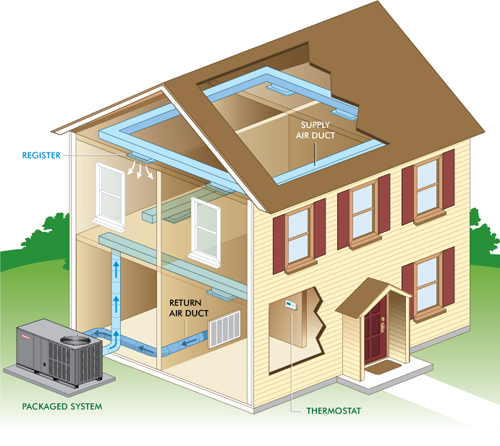 If you want to add central air to an existing home or if you have an older system in need of replacement, we can handle everything from designing a duct system that will deliver the most efficient and air flow possible to installing a new, energy-efficient model that’s sure to reduce your utility bills. If you’re finishing off the basement, we can design, build and install the duct work whether you’re working with a General Contractor or managing the project yourself. Evans, your heating and air condition experts, can even custom fabricate the duct work or fittings needed for your project to ensure you have a perfect fit every time. We can also custom fabricate hard-to-find items like chimney caps specialty sizes of flashing. All estimates are FREE, so give us a call: 970-506-0012.